A long time ago football players were two-way. They played both on offense and defense (and special teams). Depth is less of a concern when you are not going to play all that many different players in a game. In the modern era a few teams have tried to build teams around a group of dominant stars and little depth, most noticeably the Redskins and Cowboys. The Redskins have had very little success with this plan. The Cowboys have been more successful, but they also have been exceedingly healthy. That was until last year. The Dallas offense was embarrassingly bad when quarterback Tony Romo was out with an injury. The defense dropped off quite a bit when cornerback Terence Newman was out, and returned to form once he returned. The Cowboys imported quarterback Jon Kitna to backup Romo, but there are still plenty of spots on the Cowboys roster where depth is an issue. 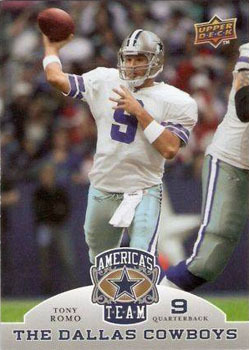 Romo is a gunslinger who will take huge risks. When the risks are paying off the offense is one of the best in football. When the risks aren’t paying off the team loses the turnover battle, and usually the game. If Romo can become slightly more judicious he’ll lead the Cowboys into the playoffs and perhaps the Super Bowl. He has plenty of help on offense. Running back Marion Barber is an excellent power back, although a bit injury prone. RB Felix Jones is fast but raw and saw only limited action last season, but he’s excellent as a change of pace back. RB Tashard Choice was a nice fourth-round pick for the Cowboys and was quite good when called in as an injury replacement for Barber. Losing wide receiver Terrell Owens won’t hurt the Cowboys, but they do need WR Roy Williams to live up to his star billing. He was awful last season but it was a tough spot for him coming in during the season without knowing the playbook. He leads a fairly talented group as fellow wide receivers Miles Austin and Patrick Crayton are pretty good. Austin is an excellent deep threat while Crayton is a tough physical receiver who can infiltrate a zone and overpower smaller cornerbacks. Actually, all three of the Cowboys’ top receivers should be able to overpower smaller cornerbacks as each one stands better than six feet tall and 210 pounds. In addition to a talented WR corps, the Cowboys have an excellent group of tight ends. Jason Witten is one of the best, and should be even more productive this season as long as he isn’t battling nagging injuries. TE Martellus Bennett took advantage of being the last guy the defense paid attention to, but he was a very good receiver for the Cowboys last season and looks to be a potential star. The Cowboys offense has a lot of skill talent. The problem for the offense is the offensive line. The line actually sent three players to the Pro Bowl but only one, left guard Leonard Davis, was deserving. Center Andre Gurode had problems in run blocking and his discomfort with shotgun snaps continued. Left tackle Flozell Adams is a shadow of the player he used to be. Right tackle Marc Columbo is decent, but the Cowboys couldn’t find anyone to play left guard at an even mediocre level. The Cowboys offensive line wore down last season. Part of the problem for the Cowboys is they simply have not developed any offensive linemen over the past few years and the current group is aging. The Cowboys’ offense was significantly better at home in 2008, and I suspect part of that was the offensive line simply expending more energy when in front of the home fans. Outside linebacker DeMarcus Ware is an absolute monster. He is one of the most dominant players in the NFL and expects to get paid like it. His contract issue might hang over the Cowboys all season. Nose tackle Jay Ratliff is the defensive version of WR Marques Colston. He was a seventh-round pick who developed into a star. Unfortunately for the Cowboys the rest of the front seven is average. The Cowboys replaced DE Chris Canty with DE Igor Olshansky, a move that could be a mild upgrade. I’m concerned that Olshansky won’t draw as much attention as Canty and offenses will be able to devote more attention to Ware. Inside linebacker Bradie James was not quite the star one would expect given his sack total, but a bit of improvement against the run will be enough to turn him into a plus for the defense. I’m just not sure how much the loss of defensive tackle Tank Johnson will hurt the Cowboys. Cornerback Terrence Newman is quite good, and CB Orlando Scandrick would form a nice tandem with him if the Cowboys give him the job. Cornerback Mike Jenkins was the first-round pick (Scandrick was taken in the fifth round), but has been outperformed by Scandrick. It appears that Jenkins will be given the starting job and teams will likely attack him instead of going after Scandrick or Newman. Free safety Ken Hamlin flat out quit once he got paid. Strong safety Herald Sensabaugh won’t have that problem as he is on a one-year contract. The Cowboys picked up kicker David Buehler in the fifth round. He should be a pretty big improvement over kicker Nick Folk on kickoffs, and perhaps will take his job entirely. The punting and punt coverage was also below average, but the Cowboys made an effort to improve their special teams coverage units. There is one other major issue with the Cowboys that I should mention. A team can win with a bad head coach if the infrastructure built by the previous regime is strong. However, eventually that infrastructure wears down, be it team discipline or simply an aging group of players not replaced by young talent. Head coach Wade Phillips is an excellent defensive coordinator and did a fine job leading the defense last season after replacing Brian Stewart in play-calling. But I have difficulty imagining Wade Phillips out-coaching Andy Reid or Tom Coughlin in a playoff game. There is an even more egregious example in the AFC (see Turner, Norv). The Cowboys have the talent to be the No. 1 seed in the NFC, but the NFC East is the toughest division in the NFL. Even a very good team like the Cowboys can finish 9-7 without having a bad season, which is exactly what I expect for them. Sigh. Football outsiders can talk as much as they want about how the Giants passing game was actually better without Plaxico Burress. I know he didn’t have the best catch rate, but I also know that size becomes more valuable in the red zone and Burress often drew either the opposing team’s best cornerback or a double team. So he will be missed. The Giants drafted wide receiver Hakeem Nicks in the first round, but it is unreasonable to expect him to replace Burress. Actually, stylistically he is a replacement for Amani Toomer. I felt he was a bit of a reach. WR Mario Manningham appears to be ill equipped to handle the NFL. SWR Sinorice Moss was quite good for the Giants last season, albeit in limited usage. WR Domenik Hixon gets a bad rap because people remember the huge drop vs. the Eagles, but he is a pretty good receiver. Steve Smith was Mr. Third Down for the Giants last year. I’m not ecstatic with the Giants WR corps, but I do like tight end Kevin Boss. He stepped up last season and the Giants didn’t miss Jeremy Shockey. Oh, one final note: Eli Manning threw 16 touchdowns and seven interceptions in the 10 games with Burress, and threw five touchdowns and five interceptions in the seven games without Burress. I respect DVOA, but just this once I am going to believe my lying eyes. Speaking of Eli I’m actually quite happy with him. He’s been steadily improving and finally completed over 60% of his passes last season. He was a bit lucky last season in terms of dropped interceptions and there will be a lot of pressure this season to produce without Burress and Toomer. 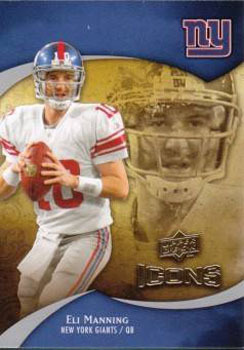 Eli has generally been pretty poor when blitzed and that is one thing I hope he worked on during the offseason. If Eli gets hurt David Carr should prove to be one of the better backups in the NFL. One thing Eli has going for him is an excellent running game. Much of the credit for the Giants running game should go to the offensive line. Right guard Chris Snee is probably the best player on the line. Overall this isn’t the most talented line in the NFL, but it plays very well together. Running back Derrick Ward will be missed but the Giants feel they have the depth to move on. Running back Brandon Jacobs is excellent between the tackles and in short yardage situations. RB Danny Ware and RB Ahmed Bradshaw are competing to see who will get the carries that belonged to Ward last year. I love fourth-round pick RB Andre Brown and we’ll see if he can break into the lineup as a rookie. However you feel about Plaxico Burress and the offense’s production without him, there is no question that the defense weakened as the season went on. The Giants simply did not pressure the quarterback as effectively as they had earlier in the season. The Giants felt that the defensive line wore down and attacked the problem by increasing their depth. Defensive ends Justin Tuck, Osi Umenyiora, and Mathias Kiwanuka form the best group of ends in the NFL. Defensive tackles Chris Canty (converted from defensive end), Rocky Bernard, Fred Robbins, Jay Alford, and Barry Cofield will also form a solid defensive tackle rotation. The linebacker corps is not quite as strong as the defensive line, and there are concerns about their pass coverage. The Giants signed Michael Boley and drafted Clint Sintim to play the wings while Antonio Pierce will continue to handle the inside. Pierce is not the player he once was. Bryan Kehl will also see significant playing time. Cornerback Corey Webster has become an elite cover corner. Aaron Ross has not been as good as the Giants hoped he would be, but he has the athleticism to do the job and the Giants are going to give him another chance. The Giants have pretty good depth behind Webster and Ross as Terrell Thomas and Kevin Dockery are both above average as nickel and dime corners respectively. The Giants lost strong safety James Butler to free agency but they should be fine. Look for Michael Johnson to switch over from free to strong safety. Kenny Phillips will take over at free safety, a move I am quite happy with. Punter Jeff Feagles is a master at punting the ball at the right distance and angle to maximize distance while minimizing returns. Kicker Lawrence Tynes benefits from a strong coverage unit (as does Feagles). The Giants return units are unimpressive. The Giants are one of the best teams in the NFC. Historically the Giants have not been good as favorites. The offense will probably be a bit worse than it was last year but the defense should make up for it. Anything fewer than 10 wins would be a disappointment. I am not predicting disappointment for the Giants, so I’ll go with 10-6. My condolences to Jim Johnson’s family and all who knew him. Donovan McNabb is not the most accurate of quarterbacks, but he has been underrated for his entire career. He was benched last season yet had the self confidence to support adding Michael Vick. It isn’t a fluke that McNabb has basically turned the Eagles into the Buffalo Bills of the NFC. Under McNabb the Eagles have consistently been a very good team, yet only once broke through to the Super Bowl. The addition of Vick is a bit hard to judge as no one knows how the Eagles will use him. It is possible that Vick will be used as a wildcat QB for six plays or so a game. McNabb still has the skills to lead the Eagles back to the Super Bowl. He is only 33 years old. Age may be nothing but a number, but Brian Westbrook is showing his. Running backs can go downhill fast and I fear that Westbrook will never be the threat he used to be. He is battling multiple nagging injuries and will probably be used judiciously this season. The Eagles got good value in the second round when they drafted running back LeSean McCoy. He isn’t ready to step into Westbrook’s shoes but will help the Eagles running game. The Eagles have added fullback Leonard Weaver and I expect their third/fourth and short problems to dissipate. DeSean Jackson is the Eagles most dangerous receiver, although rookie Jeremy Maclin looks to be a great second option. Jackson isn’t quite as consistent as he should be, although part of the blame might have to go to McNabb and his accuracy issues. The Eagles generally don’t spend too much money on their WR corps but McNabb and Reid have done a good job with the talent they have. The Eagles have upgraded their offensive line, bringing in tackles Stacy Andrews and Jason Peters. Their line has the overall talent to be one of the best lines in the NFL. The Eagles had the best DVOA in the NFL last season and much of that came from a dominant defense. The Eagles defense might not have been quite as memorable as the Steelers or Ravens, but it was as effective. Defensive tackles Mike Patterson and Brodrick Bunkley led what became the best run defense in the NFL. Defensive end Trent Cole wasn’t quite as good as he was in 2007, but he was still very effective. The Eagles defensive line is deep as well as talented, and should remain strong this season. Oh, one other thing: blitz the formation. When the Eagles faced a strange formation they were unfamiliar with they would discard whatever defense they had called in the huddle and attack the offense. The Ravens did something similar. I love that. Weird formation? We’ll figure it out later, but for now – blitz! The linebacking corps is not quite as strong as the defensive line. Middle linebacker Stewart Bradley is the best of the group. Omar Gaither was expected to become a great player but regressed instead last season. The Eagles don’t have much depth at linebacker. Free Safety Brian Dawkins had been the face of the Eagles secondary for years but on the field he simply was not the great player he had once been. He’ll be replaced by either Sean Jones or Quintin Demps, and both are quality replacements. Strong safety Quintin Mikell didn’t draw much attention from the press, but performed at an all-pro level last season. The Eagles aren’t just strong at safety as they have the most effective cornerback tandem in the NFL: Asante Samuel and Sheldon Brown. In addition, the Eagles have depth at cornerback with Ellis Hobbs and Joselio Hanson. The Eagles special teams improved immensely after picking up Tracy White last season. Kicker David Akers is on the decline but overall the Eagles special teams units should be a slight plus. The Eagles had the best DVOA of any team in the NFL last season. The decline of Westbrook is a problem but the Eagles should still be one of the best teams in football. They were unusually healthy last season, particularly on defense. I cannot quantify what the loss of Jim Johnson will do to the defense and the Eagles as a whole. The Eagles probably should have won 10 games last season and I expect them to go 10-6 this year. I don’t understand how this team is expected to win eight games this season. Yes they started last season 6-2, and finished at 8-8, and yes they get to play Kansas City, Oakland, Denver, St. Louis, Detroit, and Tampa Bay, but they also have six games vs. Dallas, Philadelphia, and the New York Giants, in addition to games against San Diego, Carolina, Atlanta, and New Orleans. Finishing in last place isn’t all its cracked up to be in terms of ease of schedule. 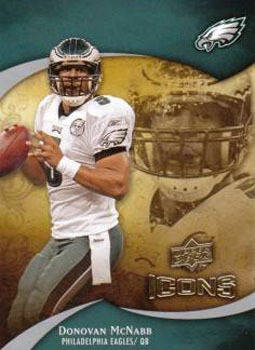 Quarterback Jason Campbell is in a contract year. He’d love to put up big numbers this season but who will he throw to? Santana Moss is an excellent wide receiver, but he was facing double coverage during the entire second half of last season after defenses realized no other receiver was a real threat. Antwaan Randle El isn’t bad, but he isn’t a player defenses need to scheme against. Tight end Chris Cooley was the only other receiving threat and as such drew too much defensive attention to dominate. The Redskins need someone other than Moss and Cooley to step up. Malcolm Kelly was supposed to be that guy and he is young enough to still grow into the No. 2 receiver slot, but he hasn’t shown an inclination to do the work required. The two main pieces of the running game are also coming off of injury. If Clinton Portis can’t return to full strength, the running game will suffer. More importantly, if offensive tackle Chris Samuels cannot return to health from a bum knee the entire offense will suffer. It wasn’t the Redskins fault that they missed out on the top three offensive linemen in the 2009 draft, but they are left with an aging offensive line. Defensively the Redskins added the single most dominant lineman in football: Albert Haynesworth. To further fortify the line they drafted defensive end Brian Orakpo. Orakpo is a bit raw but he has the talent to become an elite defensive end or outside linebacker. Like much of the roster the defensive line is filled with players on the wrong side of 30. The linebacker corps is led by middle linebacker London Fletcher. 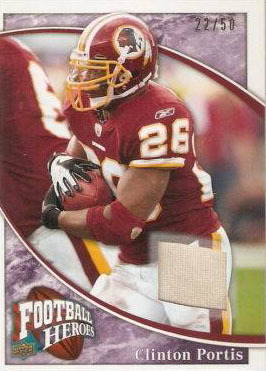 He is 34 but had a great 2008 and should benefit with the addition of Haynesworth. The linebacker depth is thin and they might put fifth-round draft pick Cody Glenn into the rotation early. Cornerback DeAngelo Hall played well enough to get paid, and now the jury is out as to whether he’ll continue to work as hard as he did to earn that payday (Haynesworth has similar questions). If Hall continues the fine play he produced in Washington the Redskins will have a nice secondary. Cornerback Chris Rogers was benched in 2008 after Hall arrived from Oakland, but he is quite talented. Free safety LaRon Landry looks like a future All-Pro. Strong safety Chris Horton functions as an additional linebacker. The Redskins have pretty good coverage units, and kick returner Rock Cartwright is above average. After those two bright spots the Redskins have lousy special teams. I can see the Redskins boasting one of the stronger defenses in the NFL, but the offense looks weak. Moreover, apart from the secondary the roster lacks depth. Offensive line coach Joe Bugel is one of the best in the history of the NFL, but he has a tough job to do this season. I see seven wins for the Redskins, mostly due to the defense keeping them close.